Dr Rose Mensah-Kutin is the Regional Programme Manager for ABANTU for Development.She is a gender advocate and played a major role in the creation of the Women's Manifesto for Ghana. 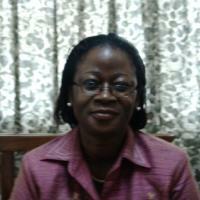 Rose Mensah-Kutin worked as Staff Writer for the Daily Graphic,one of Ghana's leading newspapers. She had a column called 'Women for Change' and was instrumental in starting the women's page of the paper. She was Assistant Editor by the time she left in 1989. She also worked with the National Energy Board in Ghana which is now the Energy Commission. She is currently the Regional Programme Manager of the Regional Office in West Africa of ABANTU for Development. ABANTU is an NGO committed to gender advocacy and development. She is also accredited with the initiation of the Women's Manifesto for Ghana which is a document containing issues of concern to women and is directed at policymakers. Dr Rose Mensah-Kutin was born in Adanse Brofoyeduru in the Ashanti region of Ghana. She had her middle schoole education at the Brofoyeduru and United Methodist Middle Schools. She passed the Common Entrance Examination with distinction and gained admission to Accra Girls' Secondary School where she completed her 'O' levels. She then continued to the Aggrey Memorial Zion Secondary School for her Sixth Form educaton. In 1975,she gained entrance to the University of Ghana,Legon where she studied English and History. She finished in 1978 and did her National Service at the Kpando Secondary School in the Volta region. In 1979,she returned to the University of Ghana to study Mass Communication. Rose Mensah-Kutin continued her studies at the Institute of Social Studies in The Hague, Netherlands. Later,she obtained her PhD in Gender and Energy Studies from the University of Birmingham in Edgbaston,UK. Dr Mensah-Kutin is married with four children.